Canadian cricket seems to get going on the right track. 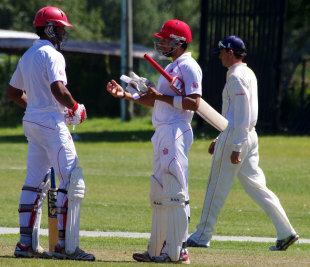 The intercontinental cup 2011-2013 saw the Canadian cricket team register their first ever victory (over the Netherlands). The Netherlands were outplayed on all three departments: batting, bowling and fielding by their Canadian counterparts. Netherlands were bowled out for 164 by the left-right bowling attack of Raza-ur-Rehman and Jeremy Gordon who took four wickets apiece. Raza-ur-Rehman was pretty much devastating just conceding eight runs in 8.3 overs with four maidens and taking four wickets. Canada pretty much set the tone for the entire match in the first innings they played, posting a mammoth total of 436. The hero of the innings was Ruvindu Gunasekera with a knock of 150. Gunasekera was wasting no time scoring 150 of just 173 balls with a strike rate of 86.70. The innings comprised of 21 fours and 2 sixes. Gunasekera was well supported by half centuries from Jimmy Hansara and Salman Nazar. With a lead of 272 runs Netherlands were staring at a likely innings defeat at 45/3. Then a ray of hope came in the innings of Eric Szwarczynski and a partnership with Daan Van Bunge. There was a knock of 75 unbeaten runs out of the blue from the tail-ender Pieter Seelaar. Even though the Netherlands fought well in the second innings, all they could come up with was a score of 336 and the Canadians just required 65 runs to win the match, which was achieved with much ease. The callback to captain Ashish Bagai to lead in the remaining World Cricket League Championships seems to be worthy now with this confident victory over the Netherlands in the intercontinental cup. Two wins were seeming likely against the Netherlands. Unfortunately the first match was called off due to a wet outfield. After winning the toss, Canada opted to field first and the Netherlands were bowled out for 143 in 27.5 overs missing to play a ball in their stipulated quota of 28 overs. Canada was going strong at 62 for 1 in 10 overs and seemed cruising to victory but the wet outfield resulted in calling off the play. It will be interesting to see what Canada can come up to counter both the weather, and the Netherlands, and bring Canada a victory.